This is coming to you from a chilly Detroit. I am in town this week for the auto show (NAIAS) and to attend some industry conferences. Yesterday I was at the Society of Automotive Analysts (SAA) outlook conference and the mood was pretty upbeat. And that is hardly surprising given that the vehicle market for 2015 hit a new record. Interest rates in the US will nudge up this year (a symptom of the US economy’s strength), but the car market should see some further growth. After CES last week, much of the talk here is of developments in autonomous drive, connectivity and the battle for the automotive value chain. If the transportation space is being radically reshaped and subject to new entrants, auto firms have a challenge to stay relevant. Everyone is talking about the new disruptors, but there is immense uncertainty about the way things will unravel. There is a long way to go before much of this stuff actually happens, but the feeling is that the pace of change is picking up. More autonomous vehicle prototypes are being tested and the smart OEMs are embracing the changes that lie ahead rather than resisting them. At the SAA, Brian Johnson, analyst at Barclays, laid out a future in which ‘family autonomous vehicles’ and ‘shared autonomous vehicles’ replace much of the vehicle parc that we have today. In his model, the vehicles in the parc are used much more intensively (average 64,000 annual miles a year versus 11,000 today). According to his calculations, that would mean a net 40% reduction in the light vehicle market in the US (around 10m units a year versus the current 17m norm). That is perhaps a scary number, but there would, of course, still be plenty to play for. It’s certainly food for thought as I walk the NAIAS floors later today. By the way, a vicious winter storm has sent temperatures plummeting here and played havoc with some people’s travel plans yesterday. 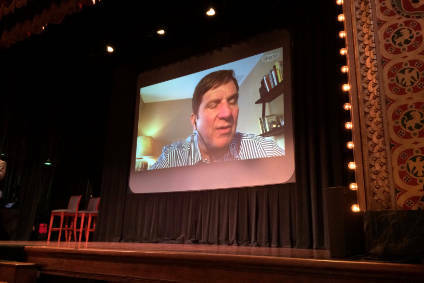 Brian Johnson’s flight to Motown was cancelled and he ended up doing his conference presentation by Skype ('dialled it in'). I thought, oh-oh, here we go, cue communication issues, Lordy, fingers crossed. You know what? It worked really well and seemed kind of surreal as it the venue was an old theatre (Gem Theatre) in downtown Detroit. So we had a nice mix of the old and new, which is a kind of nice metaphor for where the auto industry is at right now.